One of the growing trends in today’s society is to maximize the usage of appliances in our kitchens. Gone are the days when each pan had a single purpose. We are also looking to toss the pots that have the same function but are different sizes. Copper Chef Pan Reviews highlight the features of these pans and their contribution to home kitchens. Today, there is a 6-in-1 option made available by Copper Chef that has the ability to perform six different functions in your kitchen. This makes this pan a hot commodity to own. The six functions include being a steamer, rice cooker, roasting pan, baking dish, wok, and stockpot for your kitchen conveniences. With a durability of 850 degrees, this pan is the future of kitchen appliances and a necessity for those with limited space. What’s so awesome about Copper Chef pan that makes cooking easier? One of the leading features of the Copper Chef pan is its non-stick material that makes cleaning after cooking manageable for home cooks who want to make premium dishes in the comfort of their home. Coming home after a long day, preparing our favorite meal and relaxing in our home is something that is desired by many on a daily basis. Many of us dream of making our favorite dishes at home, but we are not able to do so because we lack the proper pans and materials to complete this cooking task. After reaching out to others who have the ability to make their high-quality dishes in their home, the discovery of something so amazing that all of these options were available was provided. Thanks to the Copper Chef pan, there is no excuse not to attempt that dream dinner, as almost all types of cooking that can happen in a kitchen is made available with this pan. There is no other pan on the market that is both flexible in jobs or as durable, that can not only perform multiple ways to cook but can also withstand the different temperatures required to properly cook in these different forms. No matter what type of stove or range your dwelling is equipped with, this Copper Chef pan is made suitable for all types. With the use of this pan, I am able to reduce dining out and cutting costs that I was not able to cut previously. Also, I find that the meals I prepare are much healthier since my options expanded. Like any product, there are both pros and cons that must be assessed when deciding on whether to make the purchase of this item or to pass on it. These pans heat up much quicker than the average aluminum pots and pans that we are accustomed to in our kitchens. Copper naturally is heat inductive and also has the ability to evenly distribute that heat that seems to have appeared out of thin air. They are also made of non-stick material which is beneficial when cleaning. These pans also have flexible options for use, allowing it to be a roasting pan today and a wok tomorrow for your dietary convenience. The price of this pan is much higher than its competitors. Quality products often have a higher price tag than those that are rated less. This can make it a difficult purchase for anyone who is having difficulties splurging on such an item. While you may be in need of one of these pans, you may find yourself opting for a cheaper version to prevent extending yourself over your budget. When you cook in these pans, you can expect the metal inside the pans to begin to wear early and have copper shavings in your dish. For Copper Chef, this is not the plan, as they are designed to not wear and tear for quite some time. Despite all the greatness surrounding this product, it can only cook one item at a time, which is unfortunate. If you only purchase one pan, you will have to choose which function you are using for that meal so that it can be done. One of the leading competitors to the Copper Chef, the Gotham Steel plan is also one that embeds the nonstick feature on its pan, encouraging an easy cleanup and a high-quality metal that allows equal cooking throughout the duration of the product. Not only is this pan nonstick, but it is also unable to scratch while cooking. Also, no matter how hot the pan became during cooking you can find the handle to be warm or cool at all times due to the type of metal being used. The Copper Chef plan has the ability to maximize its pan potential with a variety of other cooking options. Also, you can expect quick meals and results with the Copper Chef thanks the quick warming copper material. Because it is nonstick, you will not require the additional butter and oil needed for meats and vegetables in traditional cooking methods. The Copper Chef also has the ability to heat at a much higher degree level than its steel counterpart, which can only heat at five hundred degrees maximum. Do you need to season Copper Chef pans? Seasoning pans is a technique that has been around for over a century and was done to ensure that your food will not stick to the pan. While seasoning is not required for Copper Chef pans and products, it is allowed to season these pans to your personal discretion every 3-6 months. Season it to your perfection and check it again later if you see the seasoning coming off of the pan. Therefore, seasoning this pan is not something that must be done, but if it is a personal preference, then it can be done. Is there any guarantee for my Copper Chef pan? When you invest in a product, especially something that can be quite pricey, or require a large financial investment, it is natural to be concerned with a guarantee. Like all quality products, you can expect a form of guarantee or warranty on your products. A 60-day guarantee is available for any purchases made for your Copper Chef pan. During that time should your pan not work or provide issues, you can expect it to be replaced or your money back. How much does it cost me to buy a Copper Chef copper pan? The Copper Chef copper pans come in a variety of sizes, shapes, and uses. Depending on the pan that you are looking to purchase, a Copper Chef copper pan can cost approximately $60.oo per pan or over $100 for a pan set. These sets vary in the number of items as well as functions. Where can I buy a copper chef pan? A quick search for Copper Chef pans provides several options for purchases. You can purchase a Copper Chef pan from their website, or you can search other online realtors for the Copper Chef pan. How do I clean my Copper Chef Pan? Cleaning your Copper Chef pan is quick and easy no matter which pan you may have. Rinse out your pan after use and move it to the dishwasher for convenient cleaning. Any dishwater products that you have are safe to use on these pans. Is the Copper Chef Pan oven-safe? Absolutely. The Copper Chef pan can be used in the oven for roasting meats and vegetables to your discretion. You can fry or sear your food a top the stove and then transfer the pan to the oven. All the Copper Chef pans are made to withstand up to 850 degrees, making them all oven safe. 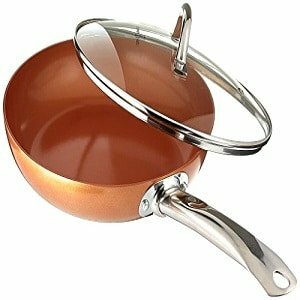 Does the Copper Chef Pan contain PTFE or PFOA? No, the Copper Chef pan does not embed either the PTFE and PFOA. Many manufacturers of non-stick pans have decided against using this chemical because of it being a health risk. What kind of utensils should I use with the Copper Chef Pan? The best utensils to use with the Copper Chef Pan would be wooden or metal due to the high heat that can melt any utensils that are silicone or plastic. Does the Copper Chef Deep Pan come with a recipe book? A recipe book does come as a complimentary gift following the purchase of a Copper Chef Deep pan. How do I store the Copper Chef Pan? Like the rest of your pots, you can store your Copper Chef Pan with the regular dishes in your kitchen or cupboard. It is important to understand and review the leading products from Copper Chef. 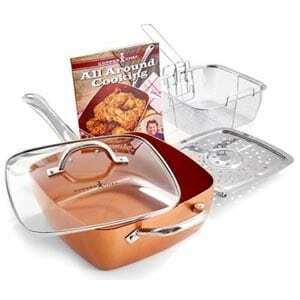 Copper Chef Pan reviews can assist you with deciding which purchase is right for your family and your needs. 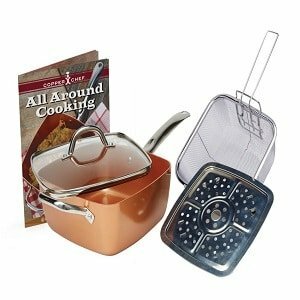 What You Will Love: This 5 Piece Copper set will provide a level of convenience that is unmatched, as it is an all-in-one cooking machine that is designed to elevate cooking as you know it. This cooking set that includes a variety of uses is equipped to withstand the various needs of the person cooking. With a 5 piece option, there is the ability to have multiple dishes cooking in different methods to build that desired meal that you desperately seek. If you need to roast veggies while making a stock on the range, there is cooking flexibility with these products. You do not have to worry about which cooking method you will choose because you will have the ability to use them each for a different purpose with a set of five. The handles found on these amazing pans are also oven safe, as they are steel hollow which protects them from the extreme heat that can be generated by an oven when roasting or baking. Heat is evenly distributed throughout the cooked dishes and distributed evenly while in the cooking process thanks to the layered materials that make up the quality of the pan. Because these five pots have the ability to cook in numerous methods, you no longer require that space taking pots and pans that you have accumulated over the years. This will allow your kitchen to have freed space which is a bonus for those renting apartments or living in homes with minimal space. With a spacious 4.5 qt pan, there is a dish for those larger dinners when you are cooking for company. As easy as it is to cook your favorite meal, clean up is just as simple with the non-stick materials and the fact that the products are dishwasher safe, which is a convenience to consider during purchase. These products are great for growing families and single people who are living in a minimized living space. In most cases, they store away well and would be a great housewarming gift for someone new to owning or renting their own space for the first time. What You Will Love: This frying pan is a more affordable option of the Copper Chef pans available, and is perfect for those on a budget. Expect it to have several cooking options available, in true Copper Chef fashion. For those of us who are watching our budgets but need something a little more versatile in our kitchen, consider the Copper Chef 10 inch round frying pan with lid, that makes for a handy piece of kitchen equipment when attempting at-home meals. With the ability to saute and grill, healthy meals are still an option while only having a single pan instead of a set. Like other Copper Chef option, expect the non-stick material to coat the inside of the pan, making it easy to clean and require minimum oil and butter. Because of its copper texture, this pan does not require the same high temperatures for sauteing that ordinary pans require. This is because the copper frying pan has the ability to evenly distribute heat and begins cooking food much quicker than ordering options. Would you like to sear your chicken or pork chops for the evening? No worries, you can safely transfer your frying pan to the oven without worry about destroying the handle or any other portion of the pan. Keep an eye on your dish by watching the tempered lid, which will allow you to visualize the completion of the meal cooking in the pan. Customers seeking this product is often beginning cooks who have ventured out on their own for the first time and are learning to cook basics. This pan is a great candidate for these people and it is also very affordable considering most of them are on strict budgets at this stage in their lives. If these characteristics sound as though they could fit you, you may want to look into making this a purchase. Request one for your birthday or Christmas to receive a quality gift that you will use several times a week. Large pan size may make storage more difficult, especially in shared spaces. What You Will Love: The square shape of the pan will host a variety of benefits when attempting to pan fry meats and vegetables in this pan. 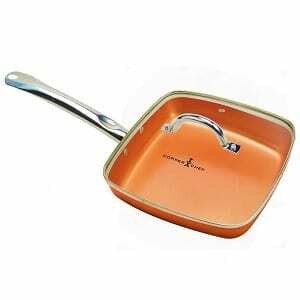 It is also an Eco-friendly pan option that will assist you in your continued economical efforts. While many do not see the benefit in a square pan, they clearly have not had the pleasure to sear and cook steaks and other types of meat that fit well in the pan. Having the right equipment in the kitchen is essential to a healthy and successful meal. Not having the right pans can completely obliterate a dish that should have been wonderful if the right equipment was available. Like a rounded frying pan, this one can also be transferred to the oven to continue cooking the dish that is currently in the frying pan. The shape of the frying pan is designed to also be larger than round pans, as they give more cooking space than their traditional counterparts. For larger meals or trying to maximize food prep options for the week, this square pan is designed with your economic interests in mind. The price may seem steep for someone just starting out, but considering the maximized space and the features available, it may be considered fair where they live. For families, the price is certainly considered more than fair so that cooking for your family has a variety of options. After cooking a successful meal for the family, just wipe the pan down and put in the dishwasher. The material of this frying pan is one that is economically friendly due to its nature to not rust and cause unnecessary cleanings. Also, the materials used to design this frying pan were done so without the use of hard chemicals that can be found on competing options. This makes this pan a safe option for families, as some competing copper pans take advantage of chemicals that could negatively impact their food. If you have a family or plan to have one in the future, consider making this pan purchase that was originally designed with your children in mind. An affordable option for those who are purchasing on a paycheck to paycheck budgets. What You Will Love: This Copper Chef Pan Set is the ultimate package with a variety of cookware for a feast of numerous cooking methods. It also comes equipped with a recipe book that will provide awesome new ideas for your family and the dinners you will be utilizing with this set. Equipped with the large 11″ deep pan for your cooking convenience, plan to cook everything from a casserole to double the chicken breasts that you could cook in a regular square pan. For large families, this set is ideal to ensure that all of the families food is cooked in one sitting and everyone has hot food to eat together. For large families, getting everything cooked at once so that you all can eat together is a struggle that you will no longer have following the purchase of this pan set. Are you looking to expand your cooking methods and maybe try out something that you have not done so before? If so, check out the steamer tray that will make healthier food options for you and the family when it is being used. Fit a roast as large as 5 pounds on the tray to feed a larger number of people. If you are looking for new ideas, but not sure where to start, check out the recipe book available. In this book are recipe options that will guide you on how to use each piece of the set, allowing your cooking craft to be expanded upon after the purchase of the pan set. With the purchase of this set, you can dispose of many of the pots in your pantry and storage area, so that you can have room for these pots and pans, but also eliminate any pot hoarding by opening up space in your kitchen. An expensive option for someone who is on a tight financial budget. No smaller pan options for the meals that are only for one or two people. What You Will Love: The ultimate cookware set includes a variety of food cooking methods for you and your family. Take on casseroles and fried foods to maximize the options for your family. If you really desire to make over your kitchen cookware and get a premium set, the Copper Chef 12 piece square casserole cookware set may be just for you. If you like to cook for your family or host large dishes regularly, consider purchasing this cookware set for your needs. These casserole dishes are designed to make the perfect oven baked casserole that will be sure to have your friends and family talking about you in a positive light. The copper material allows these casserole pans to equally disperse heat while the casserole is cooking, making solid casseroles through the middle. Nothing is worse in a casserole dish than the middle being raw or cold, which is not the case with these from Copper Chef. A quality copper silicone mat is also available to help disburse the heat from the casserole dish when it leaves the oven and finds your counter. During this time the casserole dish will be very hot and for those who are not familiar with these dishes, they can be damaging to your counter tops. Protect them with the silicone mat. 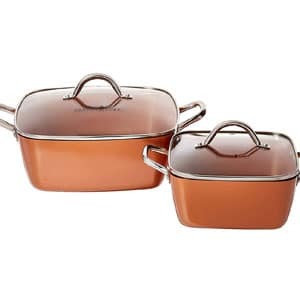 Also, consider that all of these casserole dishes, like other Copper Chef products, is free from chemicals, making it a great choice for cooking. Take advantage of your very own induction plate that is included in this set. In order to maintain that evenly distributed heat placed by these casserole dishes when cooking, the induction plate maintains that heat after the dish has been prepared. An expensive option for budgeting families. What You Will Love: These deep dish pans will give you flexibility beyond the numerous cooking methods you will have but also the flexibility of quantity, which is essential when cooking for two or more. Are you ready to broil or fry? Maybe you want to make one last pot of soup before the warm winter arrives? No matter what you have the taste for, the Copper Chef 8″/11″ Deep Dish Pan has the ability to cook in any method you choose and cook whatever dish you are craving. Coated with ceramic-tech for non-stick purposes, expect your food to lift easily from these deep dish pans after cooking has ceased. Copper is not the only material maintaining the durability of these pans, but also heavy-duty aluminum for high quality. These dishes are also economically friendly, as they require minimum washing and do not have harmful chemicals on their coating that would be damaging to the environment. 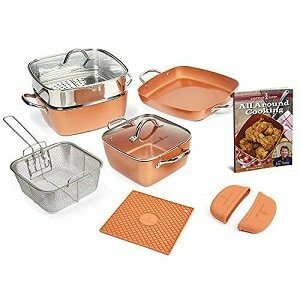 Having the flexibility of dishes is one of the unique qualities of these Copper Chef products. For this pan, in particular, there is room to make enough of something for a small family or maximize the space provided in the dish for your next work potluck or family. Its square shape provides more cooking room than the round pans, increasing the use of shared dishes among the different families. Minimizing the number of pans and maximizing space within the pan is a specialty of Copper Chef where they appreciate the customer’s desire to having so many pots and having a more practical option for cooking. A deep dish pan is a practical option that uses fewer pans for a meal and allows all of it to cook simultaneously and evenly for the customer and their family. Considering the size of the pan, it is a good idea to assume that they were designed for larger families. Someone who lives alone will have minimal use for a pan of this size. The amount of food that can be cooked in these pans can easily feed 4-6 people in one sitting. For the size of the pans and the number of them, the price tag for them is a reasonable price, with it being one of the more affordable options that have been reviewed. If you are a customer reviewing these products with a large family, this is a must-have option for your home. If you desire to learn more about the best Copper Chef pans, how they work, how they are made, and which best fits into your family and kitchen, check out these reviews to determine the best fit for you. Consider the different feature offered as well as price points before making a decision and keeping yourself in a budget. As you review these products you will encounter the option that is most suited for your needs. Stainless Steel vs. Ceramic Cookware: Which Is Best? Stainless Steel vs Non-Stick Cookware: What should I get?